That behaviour is specified in terms of closed loop time response through a desired future trajectory. The control system shows a substantial improvement in the reactor temperature controllability and a notorious elimination of the competition between the cooling and heating actuators. The improvement is partially explained by the distinction made by the model and the control modules between the heating and the cooling dynamic effects which are usually quite different. Among the origins of the benefits obtained by such a model based predictive control, energy savings come from a smaller consumption of utilities, a higher availability of the unit comes from less activated valves are non negligible aspects. But the better handling of the temperature profile provides more significant improvements on quality stability and on batch duration. Repsol Química had in mind the improvement of the control on one of their chemical reactors. 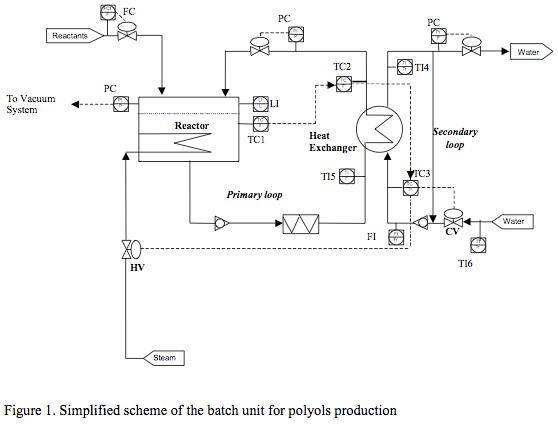 A feasibility study for the implementation of an Advanced Control technique (Predictive Control for temperature control for chemical Reactors - PCR) for a batch reactor for Polyols production has been performed. PCR covers the gap between conventional Proportional-Integrative-Derivative (PID) controllers and large Model Based Predictive Control (MBPC) applications. PCR is especially focused to solve control problems where PID shows poor performance and Multivariable MBPC is not necessary. PCR can be applied also on other units such as heat exchangers, furnaces and distillation columns. All of them can present common control problems such as integrative, with time delays, non-linearity, strongly dependent on the working conditions. PCR will make possible for the producer to push the process on its limits thanks to PCR control performance. The methodology relies on a model of the process to be controlled. 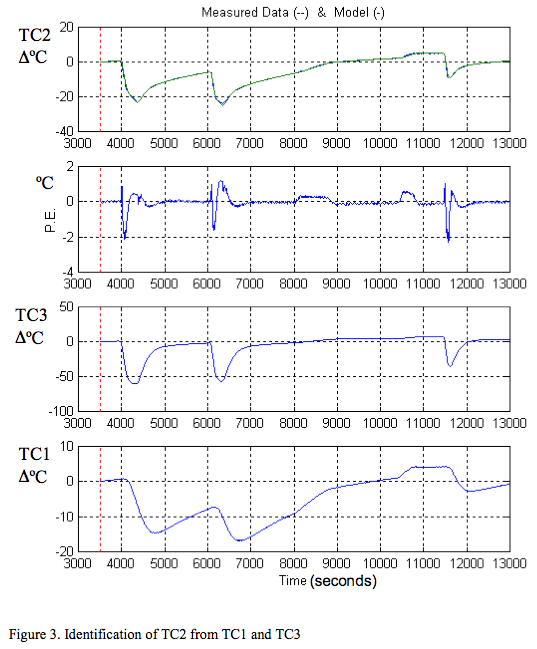 The estimated model, describing the relationships between the manipulated variables (actions) and the temperatures to be controlled, makes possible the prediction of the behaviour of these temperatures and the computation of the actions to be applied to the unit. 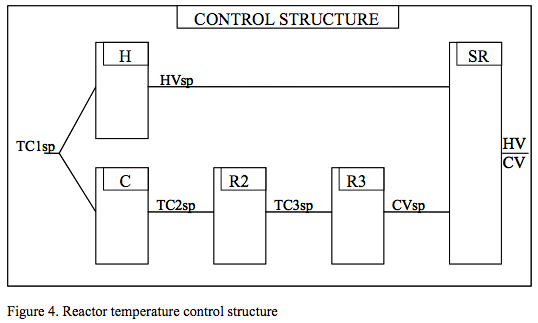 The heating and cooling actions affect reactor temperature with very different dynamics; which limits the performances of the usual split range control. 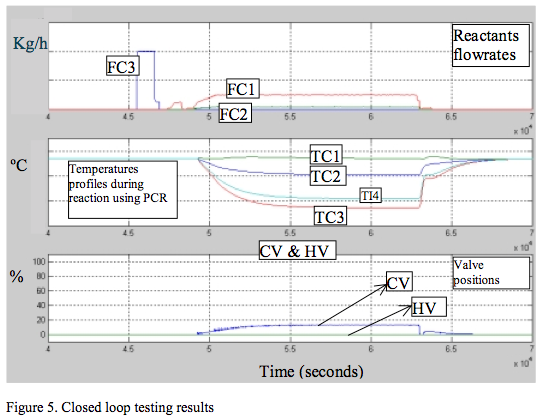 Nonlinearities in the manipulated variable, which requires a specific controller In this work, the results of the performed feasibility study for the implementation of PCR for a batch reactor for Polyols production are summarized. After a brief description of the process, the objectives of the work are explained. Then, the project steps and their results are shown. Finally, the conclusions are commented. Figure 1 shows a simplified scheme of the unit for polyols production. In order to control reaction temperature, cooling is performed by the heat exchanger which utilizes recirculated cooling water. On the other hand, heating is performed by steam, through a serpentine inside the reactor. In this study, steps 1. through 6. are presented. Project steps 7. to 9. are currently being implemented. Data collection of several complete batch operation (where the selected grade was produced) has been done. All the relevant signals around the reactor with a 5 secs sampling period, have been collected. This information has included all the process variables, valve outputs and setpoints. Manipulated variables are steam and water valves. Disturbances are reactants flowrates and fresh feed water temperature. A plant test is designed to provide the necessary information for the identification of the models corresponding to the slave controller (primary loop temperature control). The plant test is applied on a reactor without any reaction: the product inside the tank is a dead load (non active). The identification of the reactant effect (master controller) is performed from a set of recorded regular batches, without any test signals. Before starting to apply the step test, the process is stabilised around a value. When the process is in such a stable situation, the test signals are applied separately on the heating part and on the cooling part. Each of them is defined, at least, by three square waves with different amplitude and duration. The tests are done at two different reactor levels. 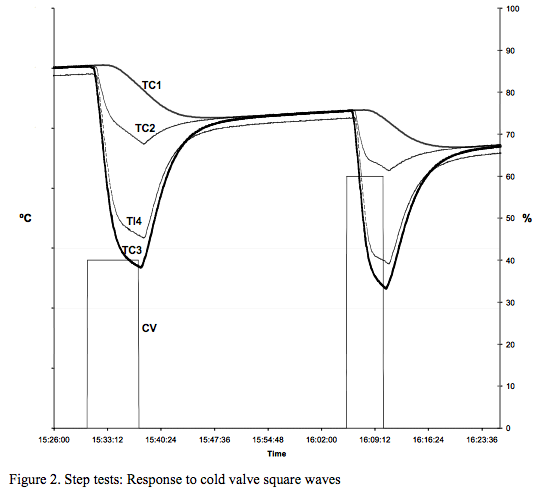 Figure 2 shows the reactor temperature profile during the tests, corresponding to the cooling steps. Figure 3 shows the results of the identification of TC2 from TC3 and TC1. First plot shows that the measured and modeled values are overwritten. The second plot corresponds to the Prediction Error (P.E.) and allows to observe the differences. Once built, comparing the behaviour of each block separetly validates the simulator. In the real process, each loop is updated with the measurements at each PCR controller execution. According to the process structure, reactor temperature (TC1) is controlled directly by the hot valve (steam) for heating and through TC2, TC3 and the cold valve for cooling. Figure 4 shows the general structure of the designed PCR controller. It is composed by the heating section, cooling section and the split range (SR) block. Heating section contains the Block H which corresponds to a enhaced first order controller with pure time delay, combined with feedforward controllers. Block H determines the HV set point having as input reactor temperature setpoint and some disturbance measurements (OE and TC2 signals). Cooling section contains blocks C, R2 and R3 which correspond to enhaced first order controllers with pure time delay, combined with feedforward controllers. Block C determines the TC2 setpoint having as input reactor temperature setpoint and some disturbance measurements (OE and HV position signals). Block R2 determines TC3 setpoint while R3 determines the Cold valve position setpoint, having as input TC2 setpoint and the disturbance of fresh water temperature. Each block has as a tuning parameter the closed loop time response (CLTR). By using collected data the PCR performance has been tested by simulation. Figure 5 shows the profiles of key variables during a batch. It can be observed that the cold valve is opened smoothly during all the reaction stage and hot valve is closed. Reactor temperature control by using PCR avoids the competition between the cooling and heating loops. Therefore extreme temperatures do not appear and energy consumption is minor. Operating conditions are reproduced better for the different batches, due to the decrease of reaction temperature variability (uniform quality). Total batch duration is reduced due to the increase in the speed of addition of reactants. Such increase is now possible because the deviations in temperatures have been notably reduced. On the other hand, cold valve has a margin to give the necessary cooling. An increase in process availability has been identified and a decrease in maintenance costs, due to minor control valve use. It is important to note the PCR shows an easier tuning because its tuning parameters have physical meaning (the Closed Loop Time response), minimizing the necessary time to adjust it. The control technique is suited for the process equipment (heating and cooling system) so it is not necessary too much work to adjust the parameters for all the recipes that run at the same reactor. At the time of preparing this paper, the final implementation project steps are being executed. "Predictive Functional Control (PFC) Applied to an Unstable System. An Industrial Application", Carlos Ruiz, Marta S. Basualdo, Aldo Molina, L. Jimenez, Benjamin Parisse and Jacques Richalet, Computer Aided Chemical Engineering, Volume 9, R. Gani and S. B. Jorgensen (Eds. ), Ed. Elsevier, pp. 731-736, 2001. "Control Predictivo de Nivel Con Retardo. Aplicación a Un Caso Industrial". Carlos Ruiz, Aldo Molina y Darío López, Ingeniería Química, no 381, Julio (2001). "Control Predictivo de Nivel de una Columna de Destilación: Una Aplicación Industrial", Carlos Ruiz, Marta S. Basualdo, Aldo Molina, Darío López, Benjamin Parisse y Jacques Richalet, XVII Simposio Nacional de Control Automático (AADECA), Buenos Aires, Argentina, September 2000. Richalet J.; Pratique de la Commande Prèdicitve. Editorial Hermès. Paris - France (1993). Richalet J.; Pratique de l ́Identification. Editorial Hermès. Paris - France (1998).